Today I’m going to talk to you about something close to my heart — my best brown dog. 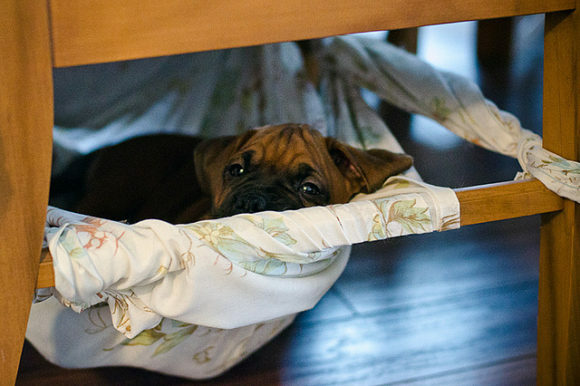 Here he is in our DIY cat bed as a puppy. He would not be able to fit a leg in that thing today. 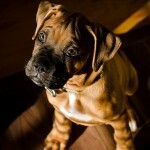 Just over a year ago, our boxer, Junior, started having severe tummy issues. He had always had slight stomach problems but they peaked last year with him starving himself and then vomiting bile and specks of blood. It was terrifying. Note: If your dog stops eating and/or drinking, call your vet immediately. We’ve been to our own veterinarian about 100 times in the past few years with our 2 dogs and 3 cats — better safe (and often broke $$) than sorry. After an emergency vet visit and testing, Junior was diagnosed with pancreatitis. He had to stay with the vet on IV fluids for a couple of days until his system was mostly back to normal. His is a chronic condition and he is on a bland prescription diet (Royal Canin Gastrointestinal Low Fat kibble), probably for life. Since our worst experience with pancreatitis concluded, he has been mostly fine and behaves like any other giant dog. The reason I’m sharing this is because, once in a while, our big brown dog will have a relapse and starve himself for a day or two. His tummy makes noises so loud you can hear them from the other end of the house. Granted our house isn’t too big, but even if it was, you’d still hear these stomach screams on a quiet day. Since this usually happens on a Monday, I mused that he missed his dad while he was away at work. 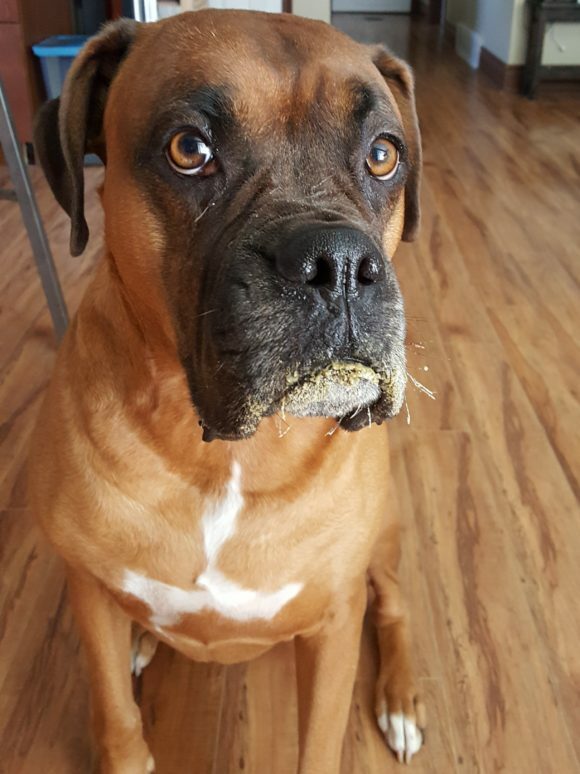 This weekend my husband headed north and sure enough, Junior stopped eating for the first time in months. We have probiotics from the vet that we add daily to his food to keep his stomach balanced. He’d have to eat them for that to work, and of course he didn’t want to. Tried giving him a treat to whet his appetite. He wouldn’t take it. Ice chips? Usually a favourite. Not this time. I even called my husband, putting him on speaker so that Junior could hear him. It mostly just confused the poor dog, though actually he did inch closer to his food. Sometimes the best course is to let him figure himself out and he’ll eat with gusto again the next morning. This morning I woke up to him gagging. I rushed him outside where he began vomiting foam. He would not drink, and he still wouldn’t eat. In all its globby glory. So appetizing. Canned (and preferably organic) pure pumpkin from any grocery store. Our corner store actually had lots of it. Warning: Do not use pumpkin pie filling. I dropped about 2 tablespoons of pumpkin into his food along with his probiotics, put a taste of the pumpkin on his gums and he instantly gobbled up a half day’s worth of food. He then looked at me like I owed him more. And I do, actually, but we always spread his meals throughout the day to prevent his screaming stomach. Looking fancy with probiotic powder on his chin. He is ‘normal’ (for him) again now. 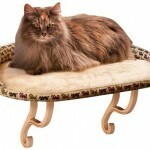 Rest assured, we’ll be consulting with our vet about this flare-up just to be safe. Again, if your dog stops eating and/or drinking, especially if this is the first time and you have no idea what is wrong, please call your vet. 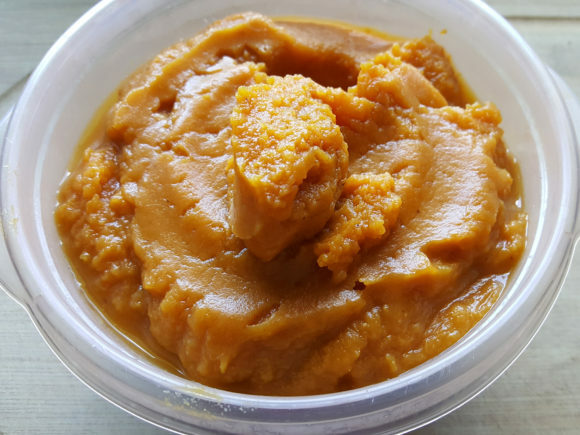 Our veterinarian has advised us that pure pumpkin is safe to add in reasonable amounts to dog food as it’s a good source of fibre and helps to ease digestion. Whether your dog has a pancreatitis flare-up, diarrhea or constipation, give pure pumpkin a whirl. 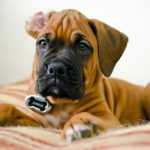 It is also appetizing to our big dogs and has almost always straightened out their stomach and stool issues. Hopefully it can help your dog too. Please feel free to Pin the image below for your own reference, and/or share this idea with friends and family using the social media buttons directly below this post! 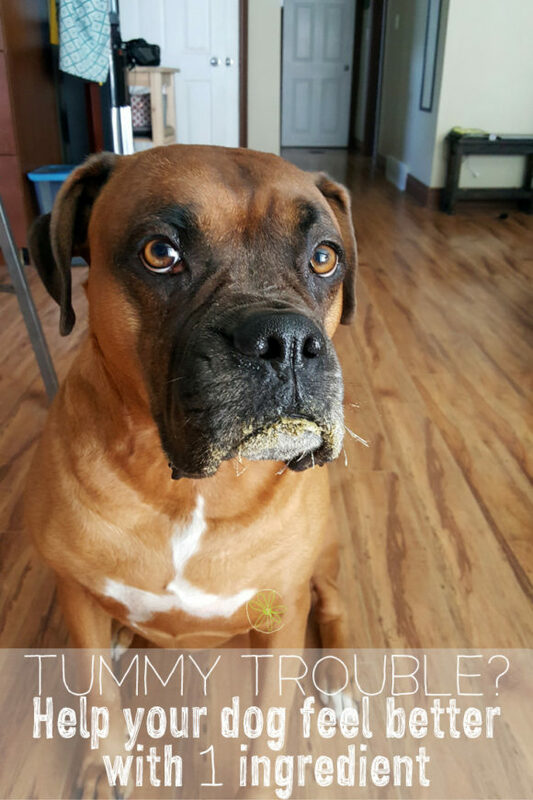 Have you ever used pumpkin to help your dog’s tummy troubles? 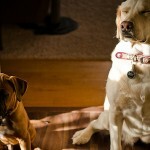 Share the post "Stop your dog’s tummy pain with 1 ingredient"
Tagged dog, pancreatitis, stomach issues. « 2 easy ways to grow your own spider plants — no green thumb needed! Sorry to hear about Junior but glad he’s better with this unusual pumpkin fix. It sounds like it works really well. I’ll definitely keep it in mind for the future! Great, I don’t have knowledge about it lets try to talk Our veterinarian! Thanks for sharing!